We procure and process special long size Remy Hair. These long sizes are above 36 and the finest and rarest. 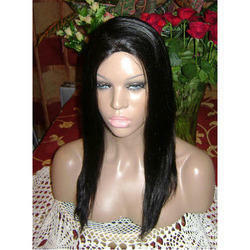 We are a preferred name in exporting Indian Long Hair Wigs, which is carefully processed. These hair provides customized solutions to our various clients and is available at competitive prices. Our range of straight hair wigs ensures superior quality and is processed as per international quality standards. Non-remy double drawn bulk hair is hackled and trimmed on both sides and it will have uniform sizes. This can be prepared from temple cut hair, which is remy or from comb waste, which is collected in villages and in houses. This Non remy double drawn bulk hair is used for manufacturing of Wigs, Hair Pieces, and Men's Toupees etc. These are available in size from 6" to 26" of length. Backed by a team of experts, we offer machine weft hair, which is processed using quality raw material and latest technology. These are available to our clients in different size and texture. These machine weft hair provided by us is smooth to touch and perfectly designed as per the specification of the clients. Immaculate Hair Clinic (p.) Ltd.